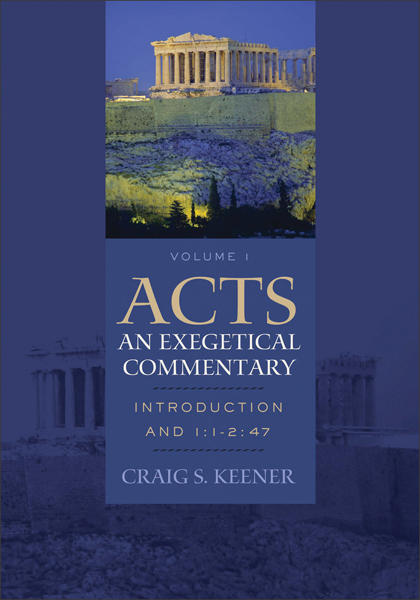 I just received my copy of Craig Keener's brand new commentary on the first two chapters in Acts. My initial impressions are very positive. Here is a quote from the prolegomenon that I appreciated. "Although my interests lie more in Luke's message than in questions of historical reconstruction, these subjects are not as readily separated as some modern writers assume. In addition to its moralistic and propagandistic value, ancient historiography also made claims about past events that differentiated it from other genres that communicated ideas differently." Craig S. Keener, Acts an Exegetical Commentary: Volume1: Introduction and 1:1–2:47 (Grand Rapids: Baker, 2012), 24.